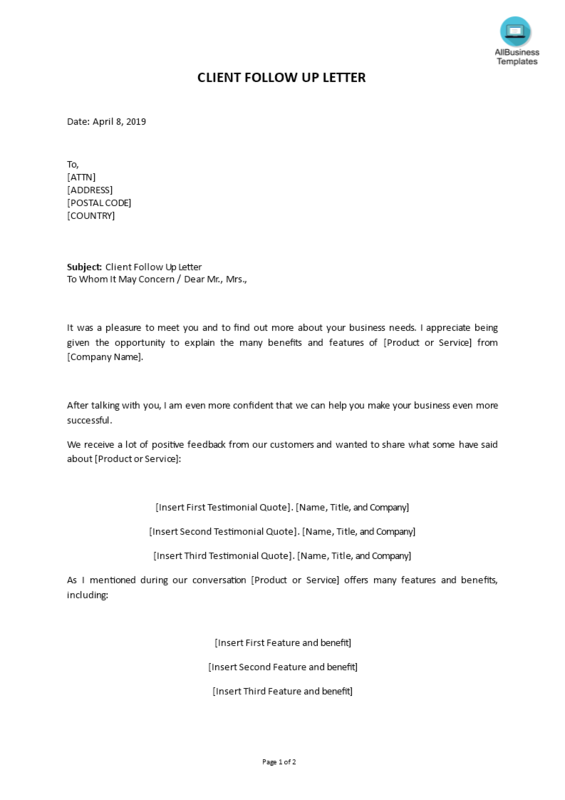 Instead, we provide this standardized Client Follow Up Letter in Word template with text and formatting as a starting point to help professionalize the way you are working. Our private, business and legal document templates are regularly screened by professionals. If time or quality is of the essence, this ready-made template can help you to save time and to focus on the topics that really matter! Download this Client Follow Up Letter in Word template now for your own benefit! It was a pleasure to meet you and to find out more about your business needs. I appreciate being given the opportunity to explain the many benefits and features of [Product or Service] from [Company Name]..